In federal agencies such as the National Park Service (NPS), rarely do long-time career employees become closely associated with a single position in just one place. However, in the latter half of the 20th century Ferdinand J. Castillo, a Mexican American born and raised in California, became widely identified with Tioga Pass, the east entrance of Yosemite National Park. Born in San Francisco in 1917, from age 4 to 16 Ferdinand was raised and educated in a Ukiah, California orphanage run by the Dominican Sisters. After high school, he attended the University of San Francisco, graduating in 1941. In graduate school he completed credentials qualifying him to teach physical education in high school. He taught swimming, raced, and coached swimmers. Ferdinand joined the U.S. Marine Corps in 1942, serving in the South Pacific on Okinawa, Guam, and Guadalcanal. After the war, he taught high school and coached swimming in San Francisco. He then re-enlisted in the Marines during the Korean War, serving from 1950 to 1951. He participated in the Wonsan landing and survived a phosphorous grenade attack that killed five American soldiers. Ferdinand joined the NPS at Yosemite in 1954. There he found a home at the Tioga Pass Entrance Station, the park’s east entrance located at 9,945 feet, the highest automobile pass in the Sierra Nevada. 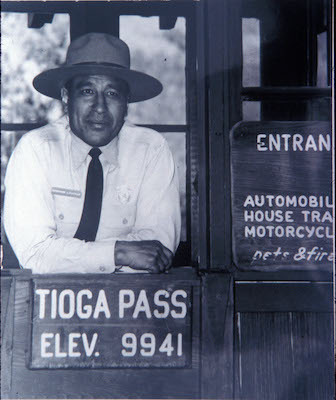 Ferdinand, a “career-seasonal park technician,” would go on to serve 39 years at Tioga Pass, not nearly long enough for Ferdinand or for his many friends and admirers. While Ferdinand’s longevity and dedication in this position is extraordinary, the positive impressions he made on generations of park visitors, the resulting appreciation for the park, and the goodwill he created for the NPS are what really sets him apart. His enthusiasm for the special nature of Tioga Pass carried over into his many interactions with park visitors. Ferdinand had the innate ability to make visitors of all ages and nationalities feel welcome, to include saying “hello” in different languages to greet foreign visitors. For several generations of returning visitors, there was no better way to begin another memorable family trip to Yosemite’s High Sierra than to enter the park at Tioga Pass and experience Ferdinand’s friendly welcome, which usually included a corny joke or two, which he would tell with a straight face and a twinkle in his eye. To see Ferdinand in action was to witness the power of enthusiasm, charm, and wit to make every visitor contact seem “fresh,” as if it were his most important contact of the day. Ferdinand was exceptional at what he did, and visitors cherished him for it. Inevitably, his deep and abiding appreciation of the area’s beauty and unique flora and fauna rubbed off on the visitors he interacted with, winning friends and creating new “citizen caretakers” of Yosemite’s high country. A conservative estimate is that over the course of his tenure at Tioga Pass, Ferdinand personally greeted over six million park visitors! As visitation increased at Tioga Pass toward the end of Ferdinand’s career, the very qualities that endeared him to so many visitors also made it difficult for him to efficiently welcome and collect fees from visitors entering the park at Tioga Pass, resulting in long lines of waiting vehicles and numerous visitor complaints. In response to those concerns, in 1993 park management reassigned Ferdinand to the slower paced Hetch Hetchy entrance station on the west side of the park. Despite numerous letters and newspaper articles from supporters objecting to the reassignment, he spent his last summer as a park ranger at the Hetch Hetchy entrance station. Months later Ferdinand passed away at age 76. Numerous tributes and remembrances followed. Among the most significant was a memorial service conducted at Tioga Pass in 1994, where roughly 75 mourners and four mounted rangers watched as a small airplane circled high above Tioga Pass and scattered Ferdinand’s ashes over his long-time home. The University of San Francisco Magazine later observed, “That was Ferdinand Castillo, truly God’s child, USF graduate, park ranger, war veteran, protector of all living things, and friend to thousands. His legacy lives on…a legacy that reminds us that one person, with purpose, can make a difference and touch people’s lives.” Well said! Rest in Peace, Ferdinand.